Oz Perkins’ The Blackcoat’s Daughter (aka February) is an atmospheric, unique film about the quiet terrors of adolescence. It follows two girls, Kat (Kiernan Shipka) and Joan (Emma Roberts) (who we later find out are one in the same, just in different timelines). Kat is a meek Catholic boarding school student who is left behind during the winter break due to the unfortunate death of her parents in a car accident, something she is unaware of. Her only companions are the nuns who work at the school and Rose (Lucy Boynton), an older more confident girl who does not want to bother with Kat. Rose uses one of the school’s urban legends about the nuns worshipping Satan in the school’s furnace room to scare Kat into leaving her alone. To Rose’s shock, she later finds Kat down in the same furnace room from the legend, laying down in a prayer like state in front of the boiler, which is ablaze. After Rose recovers her from the furnace room, Kat nonchalantly tells her that she knows her parents are dead. From here her behavior vastly changes, becoming blunter and erratic. She has been possessed by the Devil who contacts her through the school’s payphone and the boiler in the furnace room. This leads to the murder of the nuns and Rose by the hand of Kat, who is shot by police and exorcised by a priest. Satan looks on at her and she pleads with him to stay, but he disappears. She returns to the now condemned boarding school years later as “Joan”, desperate to reconnect with her demonic companion. She finds the furnace room empty and the boiler cold. The tone and atmosphere of The Blackcoat’s Daughter are a dead giveaway that there’s more at hand than a simple possession horror film. There are hardly any jump scares and the viewer is left feeling more uncomfortable or uneasy than terrified. The Devil clearly has a symbolic meaning in regards to his possession of Kat. While possession films often depict the victim as completely changed and volatile (think Reagan in The Exorcist), Kat’s change is less blatant, leading the nuns and Rose to just think the already weird young girl is sick. The other unique deviation to the possession trope in The Blackcoat’s Daughter is Kat’s relationship with the Devil. He speaks to her on the telephone and she yearns for him to stay with her, almost like a companion or parental figure. She even refers to him as “Dad” at one point while on the phone with him. He is the first real relationship she has outside of her parents. Kat is left alone for the first time in her life and Satan snaps her up by barely lifting a finger. For many young girls an older boyfriend can have a similar toxic effect, but they are often snapped back into reality by their strict or concerned parents. She is left alone with Satan and her transformation from meek girl to murderer is her metaphorical jump from adolescence into adulthood. Kat’s dance with the Devil is certainly unique, but it is not the first time in horror that a girl’s emotional or sexual maturity has been expressed through Satan. Robert Egger’s evocative 2015 film The Witch, a contemporary of The Blackcoat’s Daughter, finds its protagonist Thomasin Williams (Anya Taylor-Joy), in a similar situation to Kat. Her puritanical family is slowly torn apart one by one until she is left alone, just like Kat. There is little known about Kat’s relationship with her parents, other than that she is close to them. Thomasin, on the other hand, has a close, but strained relationship with her parents. It is shown in The Witch that Satan, through the family’s menacing goat Black Phillip, is responsible for the destruction of the Williams’. 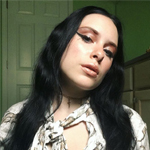 The Blackcoat’s Daughter does not blatantly suggest that Satan had her parents killed in the car wreck, though in their final phone call he tells her nobody is coming for her. Between this and him entering her life moments after her parent’s tragic death, it could be construed that he manipulated the situation to get Kat to himself. This is where Kat and Thomasin’s stories go down completely different roads. The Devil leaves Kat, essentially having used her. His brief control over her has ruined her life and she spends years trying to track him down. For Thomasin, the Devil is a sweet release she’s been yearning for. After suffering at the hands of her overbearing family and righteous God, he gives her a chance to be free. Transforming from Black Phillip into a well dressed man, he orders her to undress and offers her all the wonderful things of the world if she signs her soul over to him. She is willing and joins the other women like her in the woods, elated at the courtship of the Devil. Thomasin’s tryst with Satan could represent young women who accept their sexuality openly despite society’s condemnation of such things. She is finally comfortable with who she is. While Kat is defined by Satan, Thomasin is freed by him. The Devil preys upon more orphans in the 1977 Mexican horror film, Alucarda. Justine (Susana Kamini) is taken to a Catholic convent which doubles as an orphanage. Here she meets fellow orphan Alucarda (Tina Romero) and the two quickly become inseparable to a point where their relationship almost crosses the boundaries of what the good nuns of the convent would deem savory. The two girls are possessed by Satan and chaos ensues. Alucarda is likely using Satan as a metaphor for the taboo of homosexuality, though it does not condemn the girls for their love, rather it condemns the Catholic Church’s intolerance. Justine and Alucarda are seen as tragic rather than overtly evil. Because of this, the Devil’s metaphorical weight is more similar to The Witch, with the main difference being a tragic ending rather than a happy one. This is likely because in the 70s they couldn’t have gotten away with giving lesbian teenagers a happy ending, something filmmakers unfortunately still seem struggle with today. The Devil is less a figure in Alucarda as it is in the other films mentioned. Unlike Kat they don’t crave companionship; they already have that. They simply want to be able to be together and are punished for it. Departing from orphans, the psychedelic 1973 Japanese film Belladonna of Sadness finds a beautiful woman named Jeanne (voiced by Aiko Nagayama) using the Devil for revenge. After being raped on her wedding night by the cruel Baron (voiced by Masaya Takahashi), Jeanne is visited by a sprightly little entity who happens to be Satan (voiced by Tatsuya Nakadai). He tells her he can help her get revenge on the Baron. Ignoring him for the time being, she becomes a successful business woman, but is driven out of town by the Baron’s jealous wife. It is then she decides to make a pact with Satan, who gives her magical powers. She uses her powers for good, creating a cure for the plague and encouraging the townspeople to follow her hedonistic, but carefree lifestyle. She is later burned at the stake for being a “witch”, but as she dies her spirit is transplanted into the townspeople so she lives on, victorious. Like Kat in The Blackcoat’s Daughter, Jeanne develops a relationship with the Devil, though Jeanne is treated with more respect and regard. Jeanne’s Satan represents how much power a woman can have if she stands up to her oppressor and the freedom that comes with it. A convent is the backdrop for a possession in the 1961 Polish film, Mother Joan of the Angels, loosely based off the historical Loudon hysteria. A priest comes to exorcise a convent after another priest was burned at the stake for seducing nuns. The titular Mother Joan (Lucyna Winnicka) is the convent’s abbess and she is the most possessed of all, claiming eight demons are inside her. The priest that comes to exorcise her ends up falling for her and takes the demons on himself. To fully free her he murders two men in the name of Satan. While Joan is older than The Blackcoat’s Daughter’s Kat and the rest of the aforementioned young women, her occupation as a nun has stunted her sexual maturity. The demons, all at the behest of Satan, push her sexuality to the point of making a devout priest abandon his morals and beliefs for her. Joan and Kat are the most similar because Satan uses them as playthings and leaves them alone to pick up the pieces afterwards. Kat was easy prey because she was young, Joan because she was a devout nun. Both women are devastated and ruined by the time the possession ends; Kat because she misses her demonic companion, Joan because she knows her actions while possessed are responsible for several deaths. The Ken Russell film The Devils is based on the same historical event, but follows the facts more strictly. In The Devils, Joan is Jeanne (Vanessa Redgrave), a nun who falls for Father Grandier (Oliver Reed) – the priest burned at the stake in Mother Joan of the Angels – and accuses him of putting the Devil in her after he chooses another woman over her. No real possession or demonic contact occurs, but it is worth noting Jeanne uses Satan as part of her sexual awakening. Satan as the harbinger of sexual and emotional maturity in women is not a new concept, but the varied ways in which he plays a part are fascinating. Looking at these five examples two clear categories emerge: possession of the girl by Satan and the girl making a pact with Satan. Kat, Justine, Alucarda, and Joan are all possessed by Satan. Their stories are tragic and they are left with an empty, sad life or with death. Thomasin and Jeanne instead make deals with Satan and in return live their lives freely and work with him. The possession category is more allegorical of young women forced into an unwanted sexual or emotional relationship where they are used and abused due to their naivety or vulnerability. The pact category represents women’s liberation from societal roles and expectations. The possession is more reflective of the Christian view of Satan as evil and wrong, while the pact reflects Satanism in which Satan is a metaphor for living according to yourself rather than a deity. 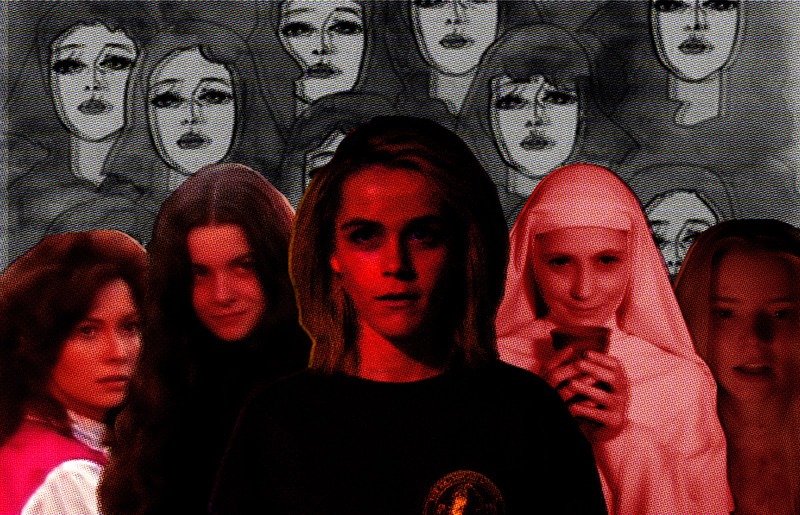 I don’t think the filmmakers behind The Blackcoat’s Daughter, Alucarda, and Mother Joan of the Angels necessarily agree with the Christian viewpoint, rather they use it to show how the Church can be one of the oppressive figures that prevents young people from being themselves. Kat was sheltered in her Catholic boarding school, Alucarda and Justine were condemned for loving each other, and Joan was unable to explore her sexuality safely. Both possession and pact show that young women should be encouraged and nurtured into their maturity, not rushed or prevented from entering it.